Newtec, Network Innovations, VRT Sandbox and Pacific Live Media have teamed up to enable the Punch Powertrain Solar Team to live stream from the Australian outback. DARWIN, Australia, and IBC2017 Show, AMSTERDAM, the Netherlands, 18 September 2017. Satellite will be used to live stream interviews and backhaul action video clips of the Punch Powertrain Solar Team as they compete in the Bridgestone World Solar Challenge – a 3,000 km solar car race across the Australian outback from October 8, 2017 to October 12, 2017 – with Newtec, Network Innovations, VRT Sandbox and Pacific Life Media today announcing their collaboration for the event. Network Innovations, a global satellite communications solution integrator, will provide its MAVERICK service, powered by Newtec Dialog®, to the Punch Powertrain Solar Team, enabling the crew to broadcast daily overviews of their journey from Darwin to Adelaide. The MAVERICK VSAT service is a unique way of delivering satellite communications, offering customers reliable, flexible, customized solutions with higher bandwidth at guaranteed throughputs. MAVERICK is powered by the Newtec Dialog multiservice platform, which features Newtec’s unique, award-winning, dynamic Mx-DMA® bandwidth allocation technology. Newtec will also be responsible for project management. VRT Sandbox will provide the technology that allows the Punch Powertrain Solar Team to broadcast a multicam “report of the day” via Facebook Livestream and will support media coverage in the lead-up. Pacific Live Media, based in Australia, offers a full range of equipment and services to acquire content right across the media spectrum, from live breaking news, to local sports and events. A local Pacific Live Media crew will accompany the Punch Powertrain Solar Team through the Australian desert and assist with all media coverage. “The challenge to deliver the connectivity needed for reliable IP video streaming, especially in this remote environment, is significant. The solution we have designed with our partners gives us the confidence we will succeed, and that we can overcome any challenges along the way,” added Chris Dredge, Managing Director at Pacific Live Media. 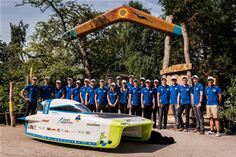 Twenty-one students form the basis of the Punch Powertrain Solar Team, www.solarteam.be. We started in July 2016 and have set out to build a top notch solar car in only 15 months. We’re going to race in various competitions, including the 2017 Bridgestone World Solar Challenge in Australia. By doing so, we want to fulfill our 4 main goals as a non-profit. The promotion of renewable energy. Racing on solar energy generated by the solar panels on top of our solar car, serves as a very strong example of the possibilities of solar energy. Generate interest among youngsters for science and technology. Together with different partners, we organize a yearly event called the Solar Olympics. We challenge all high school students of Flanders to build a solar car or solar powered gadget. After a couple of feedback sessions organized by us, they have the opportunity to exhibit their creation. Promotion of advanced technologies. We combine some of the best global technologies in our solar car. Facilitate and encourage entrepreneurship. The team members involved in building the solar car change every two years. The alumni gathered over the past years come together on a regular basis to discuss sustainable solutions towards prevalent problems. Network Innovations (NI, www.networkinv.com) is a global satellite communication’s solution integrator, focused in the provision and support of systems which enable its customers to communicate anywhere on the planet. Incorporated in 1988, Network Innovations has grown consistently and profitably through a team of professionals located at offices around the globe. It has specialized in the successful development and delivery of turn-key communications solutions for the media, energy, maritime, enterprise and government sectors. Its flexibility to custom-design solutions and integrate various satellite communications technologies for customer and industry specific needs is one of its key differentiators. Please visit www.networkinv.com for more information. Pacific Live Media (PLM, www.pacificlivemedia.com) is a specialist vendor of equipment and services to the broadcast and online media industries. Uniquely positioned across new media and broadcast, PLM represents leading manufacturers in these fields and provides both equipment and services when necessary to ensure their customer needs are exceeded. Covering Oceania, including Australia, New Zealand and the Pacific Islands (Fiji, New Caledonia etc) please don’t hesitate to make contact for more information at www.pacificlivemedia.com. VRT Sandbox, www.sandbox.vrt.be, is VRT’s media technology accelerator. VRT is the Flemish public broadcaster in Belgium. VRT Sandbox was founded in 2014 and has since won several international Innovation awards. VRT Sandbox boosts media innovation by matching startups, external organizations and companies working in media innovation to the public broadcaster VRT for short-term innovative collaborations. VRT Sandbox also collaborates with “intrapreneurs” at VRT and offers a fablab environment demonstrating bleeding edge technologies.